CellarTracker has partnered with Benchmark Wine Group to make it easier for you to sell (or investigate selling) wines from your collection. It is not an uncommon problem to have wine that (a) no longer suits your palate, (b) has appreciated in value beyond your willingness to consume it, or, (c) is maturing faster than your ability to consume it. Whatever the reason, there may be times when you would like to dispose of some wines in your cellar. CellarTracker itself is not a reseller; since the beginning, we have been very strictly focused on providing robust productivity tools for wine collectors. Nonetheless, this is a question we've been asked frequently, and we wanted to provide a seamless way for members to sell part or all of their collection. We've partnered with Benchmark Wine Group, a leading reseller which shares the same parent company as The Wine Market Journal (and with whom we have partnered closely since 2010). We have added a simple way for you to tag bottles from your CellarTracker collection into a prospective selling list. Then, when you are ready, you can send this to Benchmark in an efficient format for evaluation. At that point, you will work directly with Benchmark through their normal selling process. There is no obligation for you to sell, and CellarTracker is just helping with the initial referral. Steps 1 and 2 are handled within CellarTracker. Make A List: You use our bulk editing tools to pick bottles or wines from your existing CellarTracker list and build the list of wines/bottles you want to explore selling. Pictured below is an example of the bulk editing user interface. You can also find a link to MY SELLING LIST on the QUICK LINKS menu, and on the home page there is a link as well. Submit Your Collection for Appraisal: When your list is done, you click the SEND MY LIST button in CellarTracker to send the data to Benchmark. Receipt will be acknowledged by one of Benchmark's acquisitions professionals within one full business day. Once your list is received, you can expect to receive an offer to buy your entire collection within two to three business days. Packing & Shipping Your Collection: Benchmark can handle all of the door-to-door logistics, including on-site inventory for large collections and arranging transportation. They use their contacts in the industry to provide the most efficient and reliable shipping solution for your wine collection. If you live in the San Francisco Bay Area, their cellar team can pick-up your large collection at no charge; and Napa locals are welcome to drop off their collection at Benchmark. Bottle Inspection & Payment: Once your collection has arrived, the Benchmark cellar team will inspect each bottle by hand to confirm identity and condition. After inspection, the Benchmark acquisitions team will send a final quote and any payment terms agreed upon in the sales contract will begin at that time. For more information or to speak with the Benchmark acquisitions team about a unique situation, e-mail appraisals@benchmarkwine.com or call +1 (707) 255-3500. How is selling my collection to Benchmark better than selling it at auction? They do all the work and don’t surprise you. Auction houses can charge hidden fees, take seller’s commissions, have payment delays, and return your unsold wines. Benchmark does none of these and handles all transport. Auction house results are often below even their own low estimates and well below the guaranteed prices Benchmark offers. Will Benchmark travel to meet me and value my collection firsthand? Yes; for Bay Area cellars Benchmark can provide inventory services for a per bottle fee of $2.50. However; this fee will be fully waived if Benchmark pursues an offer and at least 50% of the overall offer value is sold. Can Benchmark pack up my wine? Is there any way I can get paid immediately upon pick up? For large collections (generally over $100,000) Benchmark can often send a team to your location to inspect, inventory and pack-up the wine on site and initiate payment at time of pick up. Will Benchmark buy all of my wine? Usually. Benchmark typically purchases collections that are greater than $10,000 but have flexibility on smaller collections that contain highly desirable producers such as DRC and Screaming Eagle. They are more than happy to take a look at any list that contains collectible, well stored wines that are in re-sellable condition. Why should I choose Benchmark? Benchmark makes the whole process simple and transparent resulting in more happy sellers. They are fully licensed to perform these transactions and get sellers the best prices quickly. Eric LeVine (the Founder/Owner of CellarTracker) has sold some personal wine with them and been very satisfied with the results. CellarTracker has also partnered with their ownership and affiliates for nearly a decade and always found them to maintain the highest standards of business ethics. How does Benchmark determine the purchase price for my collection? Benchmark has the most complete wine valuation software and data sets in the industry that optimally value all collectable wines based on recent auction and retail trades, current market trends and projections, and overall make-up of the collection. These results are then reviewed by their appraisal professionals who can offer a range of options tailored to your goals. Are these the same values I see as a premium subscriber to CellarTracker? Probably not. As described in our Automatic Cellar Valuation section, values listed on CellarTracker for premium subscribers are estimated replacement values best used for insurance purposes. These are based on final prices buyers paid at auction and what the CellarTracker community tells us they paid for, or valued, their wine at. Net sales prices at auction houses tend to be about 30-40% below these numbers. Benchmark pays well above auction net for top collections, and the highest of what licensed resellers typically pay. Depending on the make-up of your collection, the program you choose and market factors, the total amount you net may vary from this replacement value by around 20-30%. Will Benchmark give me line-by-line wine valuation detail? If you are a premium CellarTracker subscriber, they will give you most recent auction hammer prices for all of your wines automatically. If you are not, they can provide these on request for cellars of good quality and value. How long will it take to be paid? Benchmark can pay you immediately upon inspection. When they do inspection and pack up at your location, payment can be initiated simultaneously with pick up. Does Benchmark provide tax documentation? Benchmark provides a sales statement to you for wine you sell, corresponding to the amount you are being paid. The IRS and state taxing agencies do not require 1099s, or any other forms related to the purchase of your wine, to be filed by Benchmark. I don’t have an up to date inventory list for my cellar. Can Benchmark still purchase it? Yes. If you have an inventory list that is reasonably close, we recommend you send it in to provide a basis for discussion. Benchmark Wine Group always pays for exactly the wine it receives that is in re-sellable condition, regardless of whether it is on the list, using the same valuation method as those wines on the list. If you do not have an inventory list at all, or it so different from what you want to sell as not to be a useful guide, they can offer several options, including on-site inventory for Bay Area cellars at a per bottle fee of $2.50. Contact Benchmark Wine Group directly at estimate@benchmarkwine.com to discuss these options. I only want to sell part of my cellar, and am not sure exactly which part. Can Benchmark advise me? Yes. Their cellar professionals can help you select wines based on any criteria you can describe. For instance, they can recommend which wines are worth the most in the current market, which ones show signs of having peaked, and which ones are generally good “drinkers” to keep. Just send the entire list of wines you think you might be interested in selling and they can take it from there. I’m in no hurry and only want to sell if I know I’m getting the very best return. Benchmark has the broadest and most innovative programs in the industry for maximizing the return on larger cellars. These range from retail consignment, to hybrid auction/retail programs with nothing but upside to time payments with an above-market premium to cash prices. And they generally match or beat all other bona fide offers. Is there a particularly good or bad time to sell my wine? The wine market fluctuates based on a variety of factors. The market is at record high levels for many wines but has shown some signs of peaking, according to The Wine Market Journal. While there are high and low seasons for auction houses, Benchmark sells the majority of its wine into the worldwide retail market which (besides generally valuing the wine more highly than auctions) displays less seasonality so any time of year is a good time to sell with them. I have received offers from private buyers, restaurants and/or wine shops for my wine. Is there any problem with selling to them? Can Benchmark help? Unlicensed private party alcohol sales are not legal anywhere in the country and sales from private individuals to restaurants and retailers are not legal in most states. These laws are frequently enforced rigorously. As a distributor, importer and retailer, Benchmark is fully licensed to buy wine from private individuals, and other sources. They are likewise licensed to sell to private individuals and most other buyers worldwide. They are bonded, stand behind all product they handle and pay immediately. Where you may want to sell a substantial amount of wine to a friend or restaurant, for instance, they can provide all of the packing, transportation inspection, organization, record keeping and billing services, as well as license usage to keep the transaction compliant with all applicable laws, for a nominal fee. But they’ll very often pay more than those other buyers will anyway, so we recommend starting by sending them the list you are considering selling and getting their quote. They will then discuss those other options with you too if you’d like. Will Benchmark buy my wine if it’s cellared in Europe? Yes; if it meets standards. They are a licensed importer and bring wine in from Europe continually so can handle all logistics to make the process simple for you. Using the selection tools described, you can pick wines from your cellar and then have them automatically sent to Benchmark. They will be back to you shortly with an estimate and a discussion of the next steps. Alternatively, you can export your entire cellar from CellarTracker or take an Excel spreadsheet from any other source and email it to them at estimate@benchmarkwine.com along with your contact information. They can also take your list in other digital formats (Word, PDF, etc.) or you can fax your list to them at +1 (707) 255-3503. If you do fax your list, be sure to mention that you were referred by CellarTracker. Does CellarTracker receive any remuneration if Benchmark buys my cellar? Yes. Benchmark pays CellarTracker a nominal percentage of cellars referred by its users as a finder's fee. What information is sent to Benchmark? 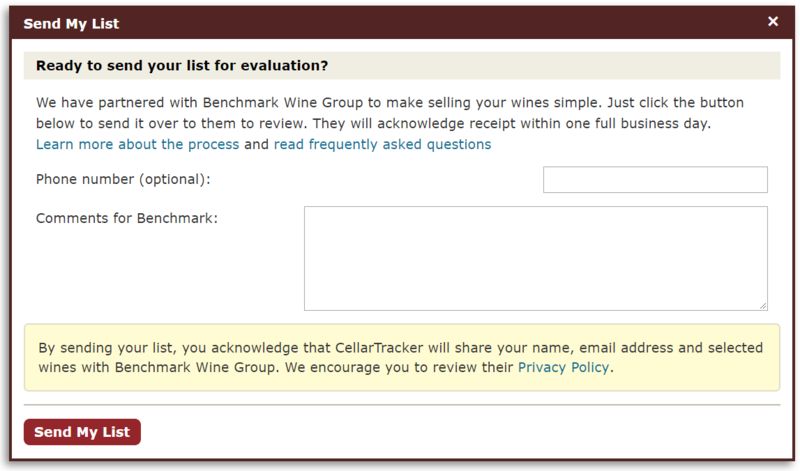 The automated email we generate comes from support@cellartracker.com and is addressed to estimate@benchmarkwine.com with the email from the CellarTracker user's account on the cc: line. The body of the email is short: "Here are the bottles I'm looking to sell. Sincerely, Full Name (email@address.com)" where the name and email are again just pulled from the CellarTracker account. If the user has filled out the comments box while sending that is included as well. We have also added an optional phone number field which is sent if filled out. There is a spreadsheet attached which has data pulled directly from CellarTracker with Quantity (the number of bottles selected by the user), Size (the bottle size), Vintage, Wine Name, Wine Locale, Wine Producer, Wine Varietal, and the CellarTracker Wine ID number. If we have associated Wine Market Journal auction data with a wine, we also include two pieces of data, FGTID and FGTName. FGT stands for First Growth Technology which is the parent company of The Wine Market Journal. If available, they are able to use their own ID number and wine name to speed the cross reference with their own valuation database.